The state of our planet is everyone's concern. As a result, businesses are increasingly setting goals to reduce their environmental footprint by lowering carbon emissions. Switching from wood pallets to iGPS' plastic platforms is a fast and proven way to do so, helping your business achieve its sustainability objectives while also extending a helping hand to Planet Earth. A comprehensive independent life-cycle analysis has proven the environmental superiority of the iGPS plastic platform. The study examined the impacts of all three types of pallets in use today: the one-way wood pallet, the wood rental pallet and iGPS' plastic platform. 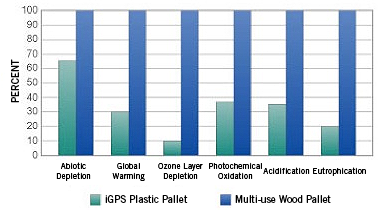 It found that iGPS' plastic platform has dramatically less environmental impact than both the pooled multi-use wood pallet and one-way wood pallet, on all measured dimensions.